This weeks photo show’s my son in one of his favorite things, my washing basket. The simplest things = the best toys. Who else has been playing on Picnik?? Head on over to Fivegoblogging and find out. I’m so incredible lucky to have some really lovely friends both here is the UK and back in SA. Unfortunately one of my most loveliest friends is going through a really tough time. In 2010 her husband was diagnosed with colon cancer. He was in his early 20’s. It was devastating to hear and to be so far away and unable to offer any practical support or just be there with glass of something warm or winey was tough. But he’s a tough guy, a couple of surgeries and a few months of chemo later and he was on the mend. Their faith, hope and beat it attitude was something to be admired. The way in which they supported each other and yet considered all those around them and their needs to see. A couple of weeks ago I got news that they had found some lesions on the liver and he could need to go for more surgery. A few days ago he had half his liver removed – he is now recovering in hospital. They’ve moved out of their newly renovated house to save some money whilst he is unable to work and will be living with family. And you know what chatting to my friend, his incredible and loving wife, all she could say was how lovely everyone had been and how supportive and how lucky they are to have such a good team of doctors and staff at the hospital. Yes, I know it’s a bit of a soppy post, but a huge five to an incredibly stong, loving, supportive, faith filled, super wife who deserves some better times ahead! If I can’t be there for you my friend the least I can do is tell you how much I admire you and your fighter or a husband! And for those reading any prayers are appreciated for this special couple! Recently I wrote about my son and his lack of talking skill! Read about it here. In response to it I got some great tips from both a friend’s sister (a speech and language therapist) and a friend is South Africa who studied “Psychology of Education – Intellectual Development in the Early Childhood” (check out her website here) – 2 people well placed to give a little advice! Do look at lots of picture books and name things, it’s more about the pictures than the words! Interact and point to things whilst reading. Play a 5 minute 1:1 game with her everyday, away from noise and other distractions. Be intentional with your words – name everything that you are in contact with – use colours and describing words pass me the big blue ball etc. Give instructions to listen and follow through with – please go to the kitchen and fetch your yellow ball etc. Encourage babbling – children LOVE to do make-believe adult things – they will want to copy what he sees you doing! So let him talk on a play phone, sweep the house, feed one of Jenna’s dolly’s, bath the doll, etc. While he is doing this, he will most likely chat away in his language. Look in the mirror and copy facial expressions and sounds (it helps if you wear red lipstick as this is so much more noticeable). Some of it we already did but it’s always good to be reminded and get some new ideas for things to do! Thanks so much to everyone who gave advise! Here’s hoping this little bit of advice can help someone else and encourage them! Even since I wrote the blog post Carter’s speaking has improved. He is so much more motivated to actually try to form words and he has got another few words in his repertoire. My husband and I were lucky enough to both be able to go to the Soul Survivor Naturally Supernatural conference one night last week. It was such a brilliant time just spending time with hundreds of other like-minded people!! The atmosphere when there are so many people in one place all with the same goal of drawing closer to God is just amazing. It’s at time like this that when I look around and wonder how anyone can say God is irrelevant, outdated, non-existent and has no place in society today. Yes, it’s not something you see everyday and no it’s not something a lot of people are exposed to often. It was so lovely to be sitting to a lovely new Christian lady who was seeing the Holy Spirit work in some new ways that she hadn’t seen before! I loved being able to share in the moments as she discovered new ways that He can work and manifest in us. In a non scary and totally loving way! It took me back to pre children where we were able to go to things like this a lot more often. Admittedly I did feel like the old aunty in the room with so many young people around, and yet all I had to do was look to my left to see a couple who looked in their late 70’s just as excited and involved in the worship as those in their early 20’s! He is truly a God for all the generations and all the people. And you know what if you don’t believe, that’s Ok, but if you ever get the chance to go to something like this take it! Don’t knock something you’ve never seen or tried. There’s a place for everyone in His house, a church for everyone – whether you like the loud or the quiet, the very traditional or more modern! Sitting at the conference I was looking at it all through a fresh set of eyes, thanks to the lady on my left, and it made me appreciate again what an incredible, mighty, loving God we serve! Ok so maybe I’ve been a little optimistic judging by the weather lately BUT I have to confess to planting the first seeds of the season! They’re inside, on the window sill nice and warm and steadily getting bigger. Some cauliflower, early tomatoes and mangetout. The kids and I spent a lovely hour planting all the seeds in the propagator ready for the windowsill! Then we decided to have some seed fun. We planted some bean seeds in cottonwool in a clear plastic glass so we could watch the roots go down and leaves come up. And we turned it into a race and labelled the glasses! So far Tamsin is winning! And I recently found a brilliant way of protecting new seedlings after planthing them out by using half a 2lt sodabottle cut in half to use as a cloche! Genius!! And the bottom half can be used to contain the seedlings when on the windowsill inside! Here they are almost 2 weeks later and in bigger containers… still inside…. And the tomatoes and cauli’s; man do they grow quick! Come on summer and warmer weather to plant them outside! The kids are so going to love getting involved this year, they do adore eating stuff they have grown… last year beans were by far the favorite, picking and eating them off the plants as they played! We’ve never been really big into the whole V day thing. We’ve always done the card thing and for the first few years until the babies arrived we did gifts but this year I decided to make some thing. When we moved into our house I bought a big frame with 4 smaller frames inside it with the intention of replacing the photo’s with some of our own. Nearly 4 years and 3 children later the frame still has the original pictures in it. With the discovery of pinterest there were a few things I thought I’d try and eventually I decided that since it’s hung above the bed in our room it should be all about us! 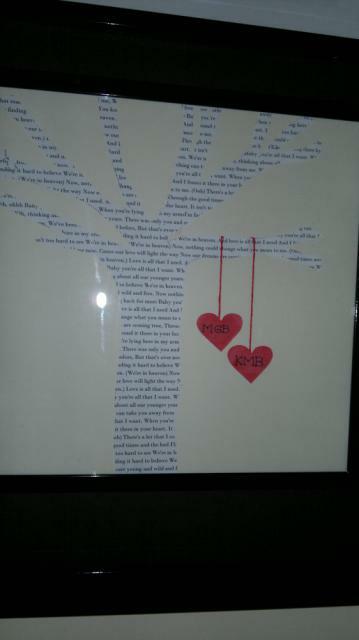 The words in the tree are the words from our first dance and the red words are the vows from our wedding. 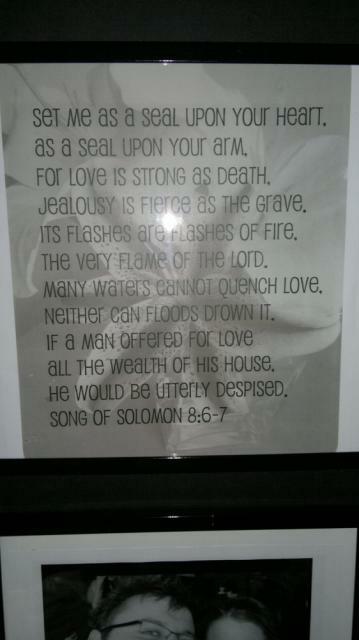 The other words are just a really lovely verse I’d seen the other day describing love. And of course we wouldn’t be us now without our 3 beautiful babies on there somewhere! Now this project was not without much frustration, shouting and some expletives. The printer ink ran out, the printer decided not to recognise the laptop and then not even print properly!! We got there in the end tho! But I will be reprinting the photo’s again to a better quality and the exact size needed!! GRRRR to technical issues! Anyway! Here’s to the last nearly 5 years filled with love, fun, excitement and children… and the next 50! I love you my bub!